The John Pye Team at the TRI Awards. Nottingham-headquartered independent auction house, John Pye, has been crowned Asset Valuer / Auctioneer of the Year for the fourth consecutive year at the UK Turnaround, Restructuring and Insolvency (TRI) Awards. This accolade is the fourth consecutive win for the company, which made history last year when it won the award for the third time. 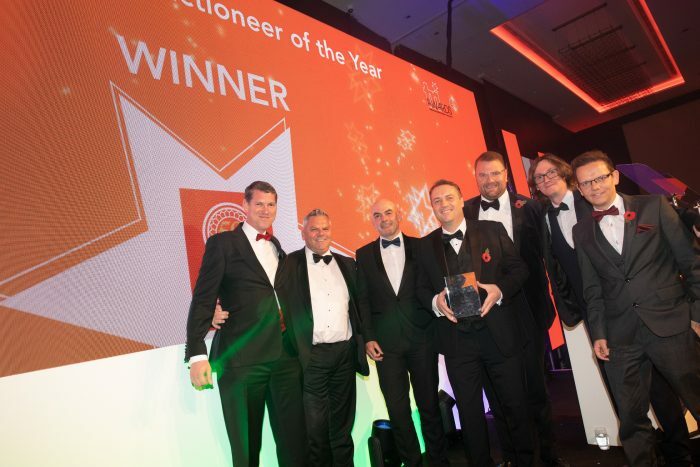 The business celebrated a double award success as John Pye’s property division took home the Property Valuation Provider of the Year award for the first time. The annual TRI Awards – which are independently judged by a panel of leading industry professionals and celebrated distinguished business leaders – recognise and celebrate excellent practice and best value in turnaround, corporate restructuring and insolvency nationwide. The judges felt John Pye brought something new to this category, showing their use of an app to keep clients informed. This innovative use of technology, and breadth of cases undertaken, was impressive. John Pye, which is celebrating 50 years in business this year, appraises, values and auctions a vast range of stock and assets: from furniture, home-wares, technology products, domestic appliances, plant, machinery, vehicles, property and luxury goods. With more than 1,000 online auctions a year, the business works with major global and UK retailers, insolvency, turnaround and restructuring practitioners, banks, lenders, government agencies, property owners and agents. Managing director of John Pye, Adam Pye, said: “Myself and the team are over the moon that we have secured this award for the fourth year running. It means a great deal to us to be recognised within the industry, especially with the high calibre of businesses that we were shortlisted with. “This year we celebrate 50 years in the industry and we are coming towards the end of another incredibly busy and successful year of expansion; having opened further salerooms and moving into new markets. “Being the winner for the fourth time is just as special as the first and our success is down to a passionate and driven team.